You have a valuable asset in your current website customers/visitors and using social media tools to convert them has never been easier. You can connect with your customers and gain valuable information to grab their attention and keep it. Pre-social media it was pretty difficult to get a handle on what your customers wanted or thought about your products. Now, using social media and you are 'listening' you can find out what consumers really think, building stronger customer relationships and improving your products/services. Website owners will pour their marketing dollars into website architecture, PPC (pay-per-click) ads, buying keywords for their SEO programs, email marketing campaigns, etc. but once they are there.....now what? To convert these website visitors into fans and gain insightful information about your visitors, get connected using Facebook. Converting your website visitors into fans of your business page is just a click away. If you can get this visitor to like your page on Facebook that's money in your pocket. It's rather easy to understand this marketing tool. This consumer visits their Facebook page at least once a day. As they scan down their home page daily, your posts will be seen, read, and often engaged upon, giving your brand or service that extra push for the sale. Also, as noted above, the association with a brand through a social network creates a measureable financial value in brand loyalty and spending. How do you get visitors to become your fans on Facebook? The first step is getting the visitor to click on the Facebook link on your page. To get them to actually engage lets first look at optimizing that little Facebook button on your website and then explore advanced ways to incentive a user to "like". This option is the standard and most basic, it will also show the number of users that have liked the page if you choose. 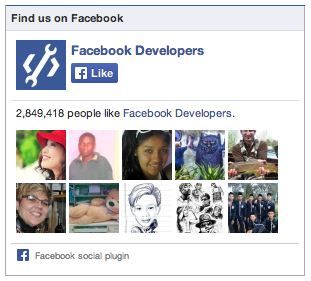 You can install a Facebook Like button using a very usefull self creation tool on the Facebook developer section. This is a favorite as the fellow fans faces add a very perso nal touch to your website. It's actually quite easy to create this widget on the Facebooks developer page here. Once added to your site, visitors will be able to first see that others have liked your page with a visual image confirmation of faces vs just a number count, once again encouraging them to like your fan page. It is important to separate your 'Like' button for FB away from any other 'like' buttons. Make sure the button clearly identifies that the visitor is 'liking' your fan page not a product, article or individual product page. For linked Facebook pages try descriptive labels instead of just 'Like', i.e. Become a Fan on Our Facebook or Follow Us on Facebook, etc. You may already have these options implemented but are still looking for ways to increase your Facebook fans. The great thing is you can now easily bribe the visitor to "iike" you using the Justuno social offers. Convert website visitors into fans, followers and email subscribers using a simple instant offer widget on your site. Emarketer reports 49% of online shoppers use coupons while shopping online and according to comScore, a top reasons why shoppers failed to complete their online purchases is because they are concerned about price. 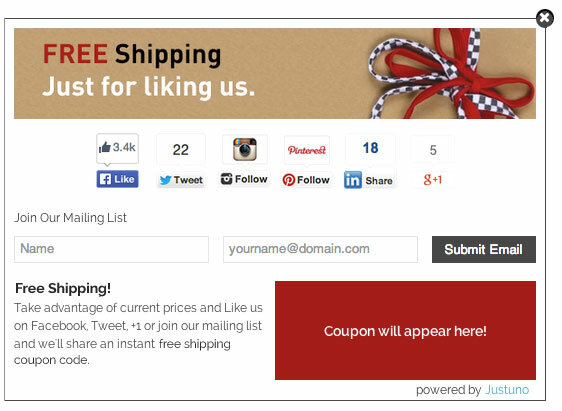 You can use your current coupons as a social incentive to convert your website visitors into fans and sales! Either way you choose to go, make sure you have a link to your Facebook page to convert your website customers/visitors into your Facebook fans and convert fans into stellar ROI. For more information on converting website visitors using social incentinves, join our weekly webinar or create a free social incentives widget today. Justuno is a suite of tools for e-commerce that gives you the ability to create and manage incentivized promotions allowing you to increase sales conversions, build your email list, and get social fans! The Dashboard also includes behavioral targeting rules, exit intent offers, and customizable tabs and pop ups. Justuno can seamlessly integrate with any website and email client making it easy for you to set up your always free account today!